Samsung S Health Fitness Monitoring App: What does S Health app do? Home Downloadables Apps Samsung S Health Fitness Monitoring App: What does S Health app do? The Samsung S Health fitness app is a rebrand of Samsung’s old fitness app, it is a more straightforward app than its predecessor and comes with improvements to give a better experience. 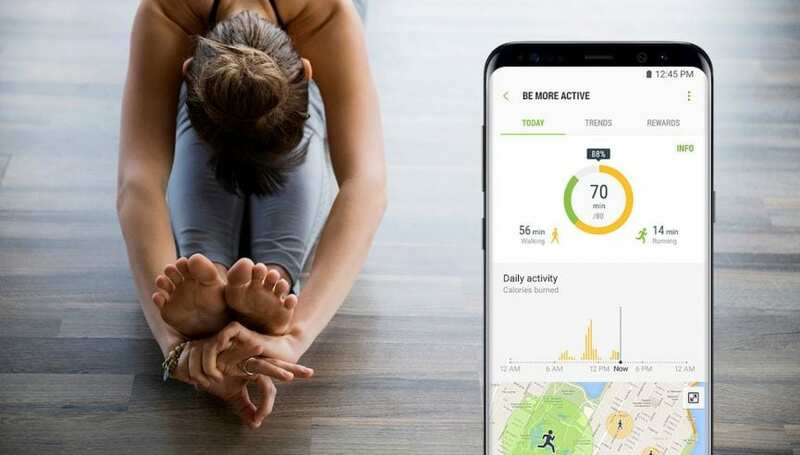 The Samsung S Health fitness app has been part of the firm’s ecosystem for a while now but has now been succeeded by the new Samsung Health app. There is a bunch of nice features to guide you to get fit and sorts out your information in a cleaner and easily accessible way. The app has been subject to a long number of refreshes and is currently on the 5.4 version of Android. The all-round fitness app for smartphones offers a huge range of functions beyond health but comes into its own when it works with a Samsung wearable. The Samsung Health app is not new but is a whole lot better rolling together a bunch of features to help you get fit. The Samsung Health app is compatible with all the Samsung smartphones, with the likes of the new Gear Sport to the Gear S3 and stores all your data. It also offers a range of features for tracking, planning and reviewing each of your workouts. For Android Wear users you can still sync some data from your wearable, but only through some chosen few third-party services. If you are a beginner who is looking to plan for a marathon, yoga enthusiast or weightlifter, there is a big likelihood that Samsung offers a tool with helpful tips to stay active during your workouts. However, you will still have to stick with your age, gender, weight, height and exercise level when starting Samsung Health which is the same with most fitness app. Customising your info has recommended by both Fitbit and Garmin Connect will help you get the most accurate training data alongside a more personalised experience. Although Samsung Health is not the most comprehensive compared to other health platforms, it allows you to enter heart rate from your wearable or mobile device. Also included is an oxygen saturation monitor that determines the concentration of oxygen in the blood using the data from your heart rate measurement. Blood pressure, Stress and blood glucose are other data that you can enter manually or estimate from heart rate tracking information. However, if there is a third party device that can obtain this information, you could also pair it with the Samsung Health app. You can also create training plan from a selection of training program for running. The available training programs include ‘Baby Steps to 5K’, Run 5K, First attempt at 10k’ and ‘Run10k. Selecting one of these, you will be told how many weeks you will need to finish and the total number of workouts it requires. You can also choose the date you would like to begin the program, and the days of the week you want to workout. There is also a significant new feature in Samsung Health where you get a video call with a doctor and ask questions and such things; you can even refill your prescription at a pharmacy. Download the S Health Fitness App here.